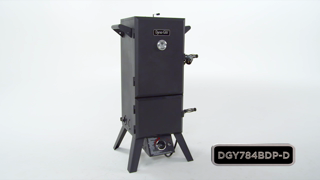 This easy-to-use, LP gas vertical smoker, is the perfect solution for year-round backyard cooking.&nbsp; It all starts with a push button, electronic ignition that emits a rapid pulse for quick and easy lighting. The 15,000 BTU, cast iron burner maintains constant temperature for reliable cooking performance&nbsp; in cold or warm weather. The double door design helps minimize reduction in cooking temperature when access to food is needed or when more water and wood chips are added.&nbsp; 4 height adjustable cooking grates provide 784 total square inches of cooking space.&nbsp;Each grate can be adjusted to accommodate whatever type of food your heart desires.&nbsp; The large capacity water bowl and wood chip box are made with heavy gauge, porcelain enameled steel for hours of maintenance free cooking. The temperature gauge features a &quot;smoke zone&quot; which indicates the ideal temperatures for infusing smoke flavor. This easy-to-use, LP gas vertical smoker, is the perfect solution for year-round backyard cooking. It all starts with a push button, electronic ignition that emits a rapid pulse for quick and easy lighting. The 15,000 BTU, cast iron burner maintains constant temperature for reliable cooking performance in cold or warm weather. The double door design helps minimize reduction in cooking temperature when access to food is needed or when more water and wood chips are added. 4 height adjustable cooking grates provide 784 total square inches of cooking space. Each grate can be adjusted to accommodate whatever type of food your heart desires. The large capacity water bowl and wood chip box are made with heavy gauge, porcelain enameled steel for hours of maintenance free cooking. The temperature gauge features a "smoke zone" which indicates the ideal temperatures for infusing smoke flavor. Recieved my smoker just 2 days after I ordered it using the federal exprees free shipping . Tracking was available right after I ordered it. Smoker was put together very easily with a screw driver. Instructions were thorough and east to follow. All the parts came in well padded box. Love the large wood chip tray, and even larger water pan. The double door design is the best for preventing heat/smoke loss during chip and water refills... I can't wait to start smoking some pork butts, ribs and chicken. Just hope this one last longer than the last smoker (Masterbuilt Pro) I bought. It's burner malfunctioned less than a year after I purchased it. Before I purchased this smoker I did a lot of research, my biggest concern was the door seal, I have seen other smokers where the owner had to purchase gasket material to get a good seal on the door. I did not need this, the product is very well made, the packaging protected all of the components during shipping, and the assembly was clear and easy to put together. The wood pan could be made of a heavier gage material as well as the water pan but they are just OK. Cooking results are very good, I have a pork shoulder on as I write this, so please feel free to give this smoker a try. I give this a 4 star rating, because I had to make a modification right out of the box. The wood chip box is way to high above the flames to get the box got enough to create smoke. I drilled 4 holes added 4 - 4 1/2 bolts and now works perfect. I've seen other reviews, that have made the same comments, hello engineering. Assembly was very easy went together in about 45 minutes.